Whoever’s in charge at WGN America obviously knows the Grand Rite inside and out, because the Devil is sticking around for at least one more season. Deadline reports the channel has renewed its reimagining of the 17th century Salem witch trials for a third season of supernatural spell-casting. 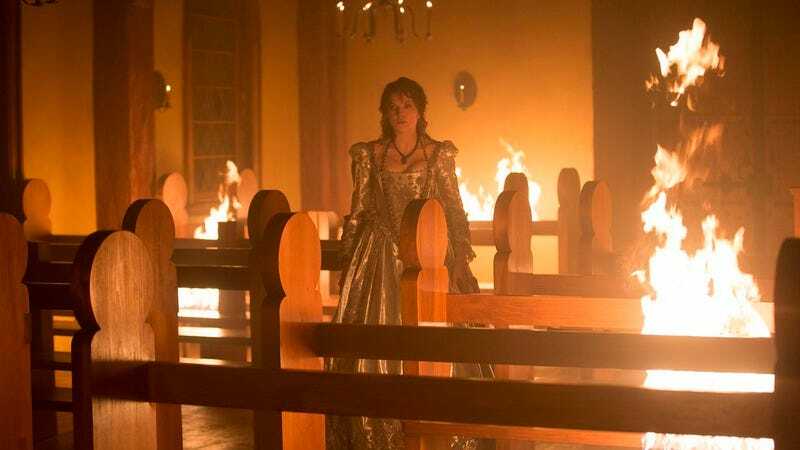 It seems the dark arts are good for conjuring an audience: Salem’s second season averaged more than 1.1 million viewers, with half that number falling in the coveted 18-49 demo. It may not be quite Walking Dead numbers (or even Talking Dead numbers), but for a station that regularly runs multi-hour blocks of Rules Of Engagement reruns, those are solid ratings. Season three will begin production later this year in Shreveport, LA, and will debut in late 2016. So maybe pull that Book of Shadows back out of storage, because you’ve got a bit of a wait.